The Seventh Salt is filmed in a dramatic environment in Argentina’s Patagonia. 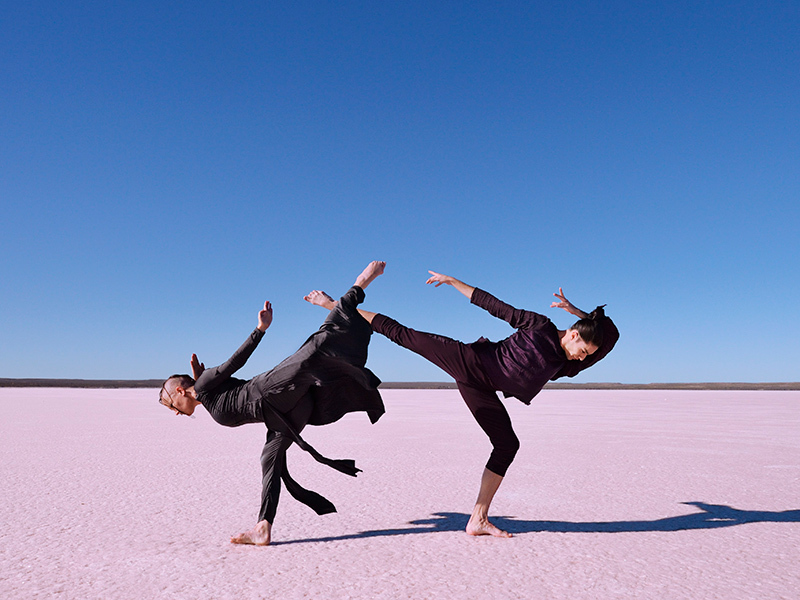 In the pink shimmering desert, dancer Fredrik Quiñones struggles in strong winds and is cast into his rite of passage. The salt flat vibrates with other forms of life. The number seven represents personal sacrifice and the search for deeper meaning. The salt purifies, preserves, and shines with a new beginning. The Seventh Salt premiered on Swedish Television November 5, 2016. Filmed in Peninsula Valdez, Argentina. The huge uprooted tree forms the background to the dancing couple, whose entwining limbs seem to be organic parts of primeval nature. Reaching skyward, searching for a foothold in the viable ground. they are capsuled in earthly paradise of decay and new beginning. Roots link one with strata of evolution process. Time-lapses and relapses. Synapses glow in a cycle of life and death. Filmed in Järna forest in Sweden. A dung beetle emerges in a desert landscape and embarks on a transformation. The shadow operates with surgical precision, pulling the darkness towards the blinding light. The hand buried in the sand, un egg of sun and shadow – the news of death calls for rebirth. The wall of sand cracks, sweeping the animal skull and the dancer with it. The flow of movement turns into a battle. The blue wind blows past. Filmed in Erg Chebbi, Morocco. ”Under the gigantic thuja tree there is a micro-cosmos. The dancer passes through several stages in the secretive protection of the branches. With the tips of her fingers she feels the thinnest branches, reading the oldest bark with her feet. The rings of the tree of life spin through her body. A high note on the flute opens up a white gate between the tops of the trees. ”Dance is image. Virpi Pahkinen, in clothing which sometimes follows, sometimes reshapes, is part of a moving image. She illustrates nothing. Instead she takes on the form of insects, organisms or a holy dwelling place. The hands that form a diamond standing on its point: a temple? antennae? a snake’s head? Over the years there have been many films and here she incorporates her dance into open, dramatic, secretive landscapes. In the two new works: “Arbor” and “Sahara”, broadcast on television tonight, trees and sand respectively are animated through her movements and presence. Under the gigantic thuja tree there is a micro-cosmos. The dancer passes through several stages in the secretive protection of the branches. With the fingertips she feels the thinnest branches, reading the oldest bark with her feet. The rings of the tree of life spin through her body. A high note on the flute opens up a white gate between the crowns. It is a winter night in central Stockholm. After that hockey kids and skaters have left the rink, a butterfly heart is left throbbing under the ice. It breaks through, develops its orange wings and starts to glide with the cold wind. The dizzying light of the full moon makes it turn. The exhausted butterfly frozes into a guardian of the icy field inside the city mandala. The music is Vivaldi´s winter, scratched and electrified by Mattias Petersson and George Kentros. Premiered at 29th Uppsala Short film Festival 2010. Filmed in Vasaparken, Stockholm, Sweden. 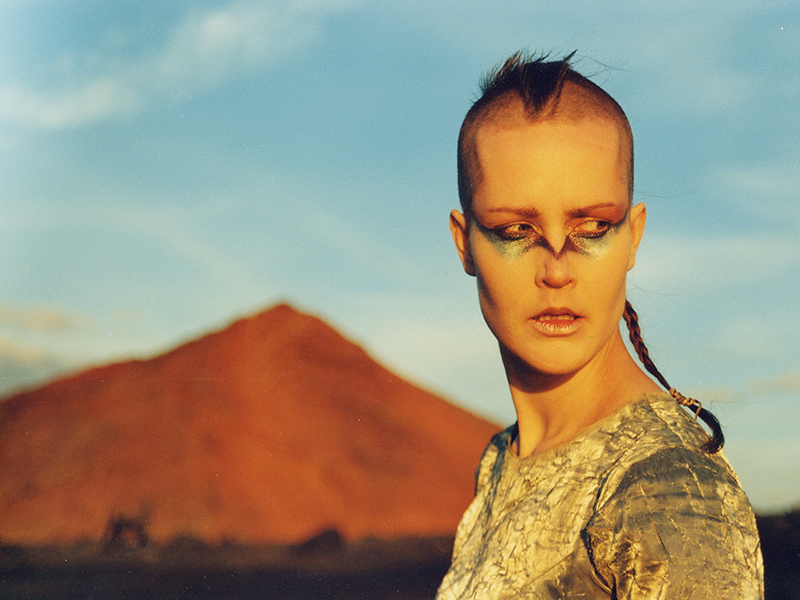 Filmed on the remarkable volcanic mountains of Lanzarote. Virpi Pahkinen’s distinctive choreography portrays intractable forces “Soft formations of bone that look totally silky meet a harsh hard moon-landscape of red and burnt brown tones, in the middle of this nothing, the dancer and choreographer Virpi Pahkinen in wild sinking movements. That ”an image says more than a thousand words” is a great lie in what is called the context of art. Few film-makers today succeed as well as written poetry in conjuring out emotions without relying on a simple identifiable action.